Let's get one thing straight: I don't do 'activity holidays'. I seriously don't enjoy going on a trip only to come home covered in cuts and bruises from the kayaking/skiing/rock climbing I've decided to try on a whim. Not to say that it doesn't happen on the odd occasion, but the main activities I usually enjoy err more on the side of lying on the beach and sightseeing. I'm a pro beach-bum. So when I planned my Big Euro Trip after university, Lauterbrunnen wasn't a place that appealed to me much. To be totally honest, I hadn't even heard of it. Let's rewind back to 2012, when the Big Euro Trip was in its' planning stages. My friend Amy and I wanted to see some of Europe as or reward for suffering through 4 years of a course we both hated. We talked about Interrailing, but it didn't have much appeal. We looked around most of Glasgow's travel agencies, and finally stumbled on a brochure for Busabout. This was way more up our street. Slightly organised 'tours' with buses we could hop on and off as we pleased. Our things would be safe, we'd have people to talk to about the destinations we were headed to, and we were travelling with a bunch of people that changed with every bus we got on. Perfect! There were so many different routes to choose from, but we eventually settled on one called 'The Alpine Express', a journey which started in Rome and ended in Amsterdam. Of all the stops in between, neither of us thought we'd be very impressed with this little village high up in the Swiss Alps which seemed kinda boring if not very very pretty. But it was a stop on the way and we figured spending a few nights there would be doable in the grand scheme of things. Whilst on the long, windy road to the village, the guide on the bus talked us through all the various activities we could participate in whilst we stayed in Lauterbrunnen. Like I said, I'm not usually one for adventure sports, and there was no way i was going to run off a hill attached to a guy with a parachute. Bu surprisingly, we both decided to have a go at white water rafting and zip lining. Yup, we were shocked (and out of cash...Switzerland is expensive!) A short phone call for emergency backup funds to my dad later and we were sorted. We were going to race down some very rapidy rapids with people we had only just met. Then we were going to trust our lives to a helmet and a wire. I was bloody terrified. What can I say? White water rafting is probably the most fun I have ever had whilst wearing a life vest and a super thick wet suit. I won't lie, Amy and I did minimal work, and giggled our way through the whole experience, whilst the 4 poor Swiss people stuck on the raft with us were left with all the paddling. I said I had fun, not that I worked hard. The people at Outdoor Interlaken were absolutely amazing, and I'd go back to Switzerland just to try the rest of their sports. I even fancy canyoning! The zip lining on the other hand...well, it taught me I have a healthy respect for heights. By that, I mean I got all the way to the top, hooked myself on, then decided it wasn't for me and made Amy do the whole course herself whilst i sat on the sweet, sweet ground. She then had to do it all over again when I decided I was brave enough after all. What a terrible friend. Safe to say there aren't any photos from that experience. It was still fun! 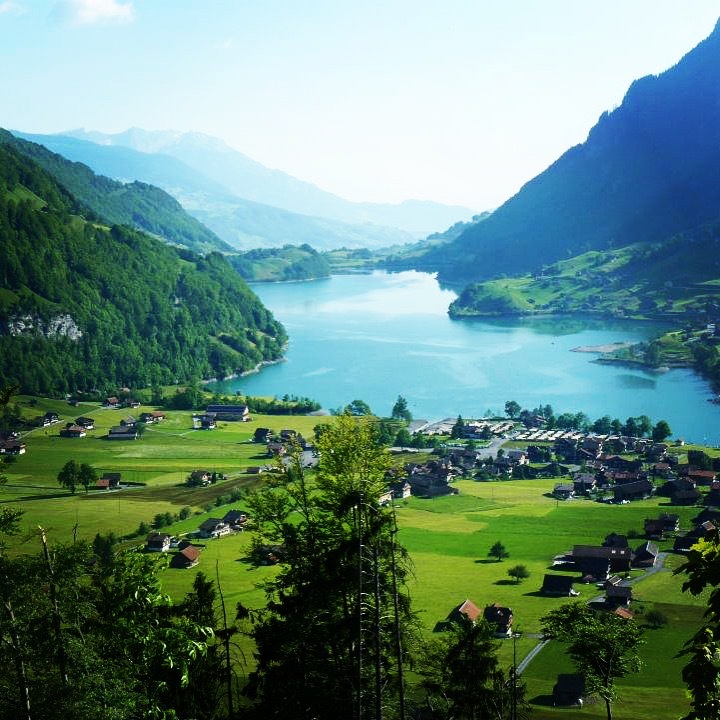 As for Lauterbrunnen itself? I still rave about it. The village is one of the most picturesque places I've ever been in my life, the valley dwarfed by the cliffs and amazing waterfall. I had one of the best nights out of the whole trip in the villages only pub. I had a lock in with the owner of the hotel I was staying in (the night before white water rafting...definitely a good way to get over a hangover!). The vibe of the place was amazing, full of young, friendly people who would share a casual lunch before taking a death defying leap off one of the surrounding cliffs. Sigh...Lauterbrunnen, I haven't had enough of you. I'll definitely be back. Our trip with Busabout doesn't exist any more (boo! ), but you can check out a similar one here, or simply buy an Unlimited Pass or a Stop Pass depending on how much time (and money!) you have to spend! I'll definitely be Busabout-ing sometime soon!